How do you like your eggs? Scrambled for me. But I’ve had ’em boiled (hard and soft), poached, fried (sunny side up or over easy), and Benny. How do your like your eggs? I have a co-worker who likes them toasted. Here’s the story. I came into work one day to find two eggs in the toaster. They belonged to Joe, an Italian tooling specialist. Picture this conversation with the stereotypical Mario accent. So there you go, folks. Toasted eggs are better than hard boiled! There’s a young guy at work who consistently makes me laugh. He’s uber-intelligent and quirky and does something weekly that just slays me. The most recent incident happened in the lunch room. I was sitting there beginning to consume my reheated-whatever, when in he walked…backwards. Right to the fridge, reaching behind him trying to open it and get his lunch. I’m sitting there in stitches, unable to eat! I kept bugging him about it over the following days, calling him “The Backwards Man”. “I only did that for like 10 seconds!” he protested. That was a damn funny 10 seconds, man! Sunday Chuckle: It’s Patrick, he took out life insurance! Surely, Canadians of a certain age remember this ad from the 1990s! I found this ad on one of my tapes, when I was recording a CBC show called Ear to the Ground. It was a special on Bob Rock’s band Rockhead, that I hope copyright law will allow me to post in full. Enjoy this routine phone call between Patrick and his parents, about life insurance. Hannah Cheesman is the Canadian actress who plays Airiam in Season 2 of Star Trek: Discovery. Airiam has been a mystery character until recently. Without getting into spoiler territory, Airiam had a big episode this season, and Cheesman made it something very special. I wanted to see what’s up with the newest member of the Star Trek cast, and I stumbled upon her Instagram. Check out the video of Cheesman singing in the car. I laughed pretty hard. This is what happens when your radio is busted! I am now officially a huge Hannah Cheesman fan. She’s hilarious! We were out having lunch with a buddy and his kids the other day. We love his kids. The seven year old boy, who loves Transformers as much as I do, is a good kid. As we sat in the Boston Pizza waiting for our food, the boy was playing with his brand new Optimus Prime figure. We were all sharing stories of things we did that got us in trouble as kids. That’s when the little boy shared his own. You see, pooing just takes too long. He likes to grab some toilet paper, get a grip and pull that sucker out manually. I laughed so hard I could barely breathe! Thanks for the chuckle, Optimus Poo! By now you know that “Rogu” is my favourite new American Dad character. I decided to set him up as my desktop background at work. The result is suitably freaky. Mail call! 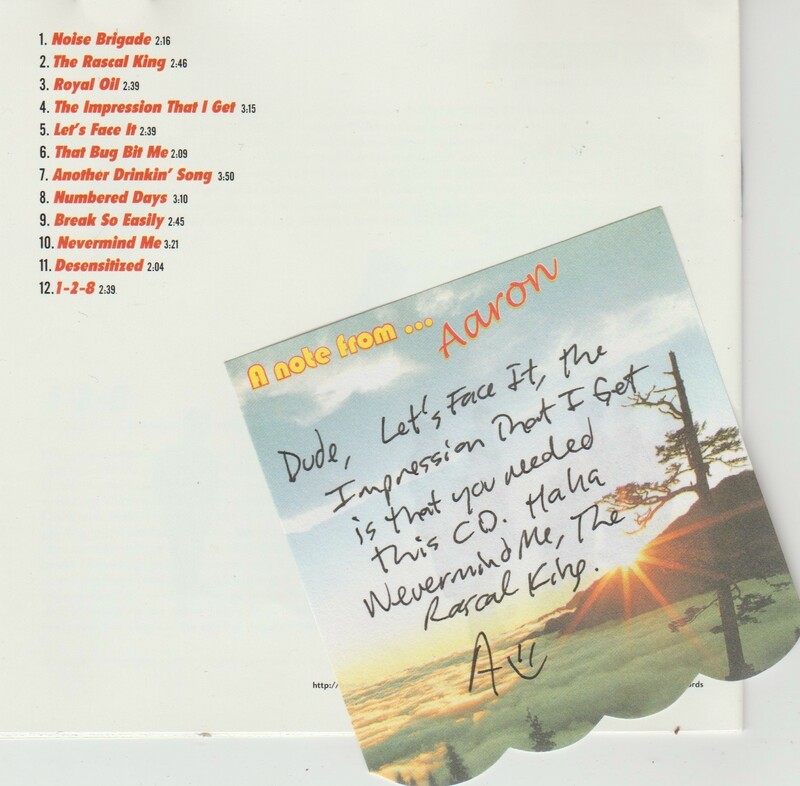 I received a CD this week from (who else) AARON! Now playing: The Mighty Mighty Bosstones’ Let’s Face It! Check out Aaron’s cool stationery and hilarious note. This Sunday, a sneak preview of an upcoming episode of VHS Archives! Sebastian Bach of Skid Row sat down with Teresa Roncon on the Power 30 in 1992, and laughed real funny. I recorded it and 27 years later I made a clip of it. ENJOY! 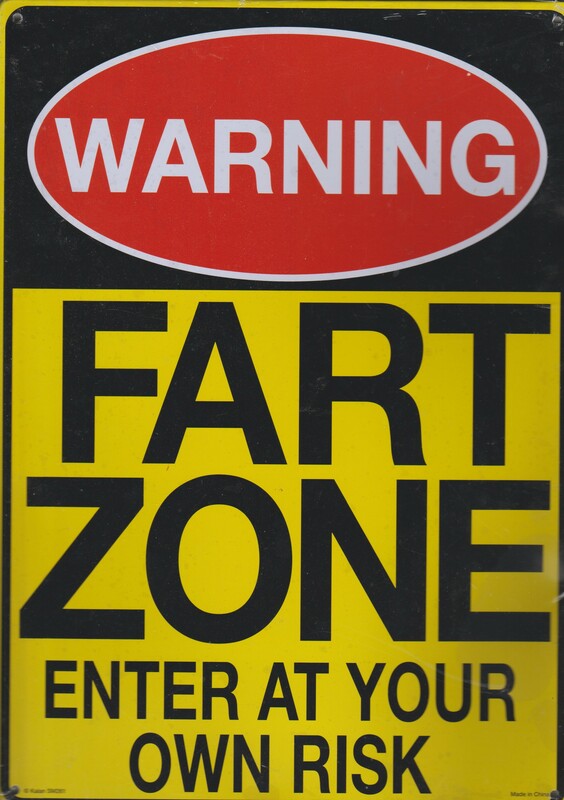 My wife bought me this sign. It hangs in my work area at home.